That does look good! Might be a bit on the hot side or me but you can adjust the amounts of peppers easily. When he took the lid off after the second hour it looked like a real winner. Yeah, I'd have left some of that out myself. For me, the jalapenos seemed a bit 'out of place' in that recipe, too. That's a good looking one pot meal. I enjoy spicy foods, but it seems to me that there are too many heats competing for flavor. Also, I've never heard of or tasted the Campbell's Poblano and Queso Cheese Soup. I'll have to look for that next time I'm at the store. Thanks for sharing Wolfy. Yep. I would probably leave out the jalapenos, the cayenne powder and substitute more regular sausage for the spicy sausage. That would leave you with the chipotle and poblano flavors. Now were talkin', great idea. This sounds a little weird, but TRUST me! Combine stuffing mix (w/ seasoning packet) butter, water and juice from canned peaches; spread on bottom of 12" dutch oven. Season pork chops w/ salt and pepper; Brown pork a little first, for color; Place on top of stuffing mixture. In a small bowl, mix apricot preserves, Dijon mustard, and onion; spread evenly over pork chops - arrange peach slices on top. Bake in 12" Dutch oven at 350* F for 1 hour. Hey Craig, I told you I'd let you know how it worked out with Chicken, I didn't go with any rub like we discussed, I butterflied a couple of boneless skinless chicken breast so that I ended up with four good sized fillets, I seasoned them with seasoned salt and pepper and browned them a little in butter and olive oil then set them aside. I mixed up the stuffing mix, butter, hot water and peach juice and layered the bottom of my dutch oven with the stuffing mix and laid the chicken on top, then I mixed the preserves, mustard, and minced onion and smeared it on the chicken, then topped it off with the sliced peaches, then covered it and baked it at 350* for one hour. I had a fear that the stuffing was a bit wet, 1-1/4 cup of hot water, 1/2 a stick of melted butter, and about 2/3 cup of peach juice left the mix pretty loose, when I uncovered the pot it looked pretty soupy, but after letting it set for a few minutes to rest a bit it seems to have settled a bit. I will make this again, it was great, it was sweet and savory at the same time but not too much on either end, my wife loved it as well, so thanks a bunch for sharing, we will be enjoying it a lot in the future, next time I'll make it with pork tenderloins, but next time I'll reduce the cooking time by about 15 minutes, being at close to sea level it may cook faster here than where you are, the chicken was a bit over cooked, but still delish. I'm SO glad to hear that you both enjoyed the basic recipe. I've never done it with chicken, but I will, now that you gave it the green light. The difference in cooking times may have something to do with the fact that I have never done this dish in the kitchen.....I was just guessing at temperature and time in the recipe. I CAN say that it's a big hit around the campfire outside in the 12" Lodge camp Dutch oven, though! Like I said, it was great, anytime I intend to make something again it's 'cause it was good, and if you noticed, outside of reducing cooking time a little I didn't suggest any changes, I followed your recipe to the "T", usually I end up tweaking a new recipe in some way, your's is fine just the way it is, and I wouldn't use a rub on it, it's good just like it is. It's worth saving as we leaders used it a lot to feed ourselves......we like to eat well. I decided to do the update edit to this thread because I see a lot of our 'guests' tuned into it when perusing the online guest list. With over 15,000 hits to date, it must be something people are searching for when they come here to B&B to check us out.....updating the link just seemed like the thing to do, if they are seeking information. Maybe I'll contact one of the forum big shots to see about updating the link in post #6, too. I've gone through several DO cookbooks and the links here trying to find a specific DO recipe for Mac and cheese in a 10 or 12. I found several of course, but they all "enhance" the mac and cheese with stuff I don't want. I'ld like a coupla cheeses in it. I like it crispy on top. Rich. No chilis, hamburger, East Yuhoopistan Boo Boo Wah Wah spice... you get the picture. I'ld like to be able to throw dry mac noodles in and let them cook in the DO like some lasagna people do. One less pot. You're probably right. LOL. I just need a few practice runs to get coal number and cooking time down. That's the way we like mac'n'cheese, too.....but I don't know that we ever used a specific recipe. We just cook the pasta until it's 'al dente,' add a little butter & milk, a little flour and cook a little more to thicken. Then add whatever & however much cheese or cheeses you think looks good or can afford. The last we made was with white cheddar & gorgonzola with extra gorgonzola crumbled over the top toward the end of the baking time. Delicious! I'm a whiz at all kinds of good stuff but my mac & cheese always sux. Thanks a bunch. I can see this ring of coals on the bottom working quite well. Even if it is a little late in life for me, danggoneit, I'll start writing things down. Somewhere around here I have an oven thermometer, what should I do, how should I use it. For scientific purposes only. I think I tried an oven thermometer in my very first camp Dutch oven (regular 12" Lodge) a looong time ago, but I can't remember exactly how I did it. It seems like I set it on one of those cheap round wire racks that I get at Walmart for roasting chickens, meatloaf, etc. to keep them out of the grease. My thinking there, was that it would keep it off the bottom of the oven & more in the very center of the chamber for a more accurate reading, but I can't remember the results, either. Black or smoking indicates 500 or above.....about right for casting bullets. Here's a pretty good list of tips for outdoor cooking that will make things easier and less of a chore. I know many Dutch oven cooks prefer the convenience that charcoal briquettes provide. I sometimes do, too......when it's too hot outside to have to tend a hardwood fire to get a good glowing bed of coals.....it's also easier & faster when I'm cooking with a 'flock' of ovens and I'd rather spend time with our guests or when open fires are either not allowed or dry conditions make them unwise. I prefer the 'ring' method of briquette placement and don't ever count them, but for various reasons many folks still like to count their briquettes. I found this video of a method that combines both ideas into one. It makes sense, especially if you are economizing or running low on them and want to avoid waste by starting too many. Anyway, I hope some of you find it useful! I just used one of these recipes yesterday! The Tamale Pie 2 recipe. We used Famous Daves cornbread mix because that was all that was available and it was good, but it was sweet enough that it didn't really taste like a tamale. Does anyone have any recommendations for an unsweetened corn muffin mix? It was good, but I really couldn't see much difference between it and plain ol' Quaker Brand cornmeal. Yellow or white.....your call. Thanks a ton wolfy. Both of those are downloaded and going onto my kindle paperwhite that travels with me everywhere. OK, here's another great updated source for dishes designed for cooking in Dutch ovens. It's a good one! I am somewhat dumbfounded by how much time has leaked away since this wonderful recipe resource was posted. For those of us on the short side of things........Yikes! I've posted this method of Dutch oven temperature control before, but I found it in an easily copied PDF format that you can keep with your favorite DO cookbook or chuckbox. Once you use it, referring to the chart will become unnecessary. It's FOOLproof.......exa ctly why I've used it for years! This method works well with all sizes and brands of briquettes, lump charcoal or campfire coals. Thanks for posting this. I could not remember the name of the thing. Thanks wolfy. Just in time for the last Kracaneuner Tribe camp. Good stuff. Since I posted this chart yesterday afternoon, I see that it has been viewed 40 times. I should probably have posted it as a separate thread under FOOLPROOF DUTCH OVEN HEAT CONTROL....and still may, so it's easier to 'search.' I hope those that have been curious enough to look at it take it as gospel....because produces a VERY even heat throughput the oven and it ALWAYS works! 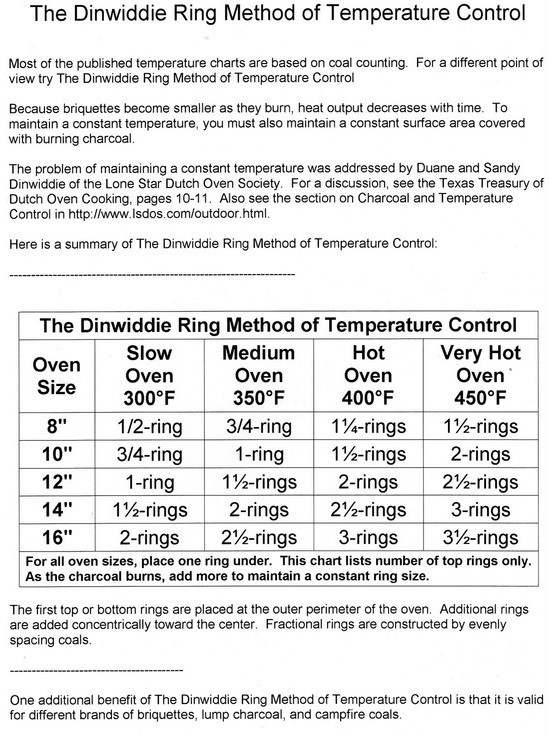 Most importantly, it eliminates the ridiculous 'coal-counting' ditties, the math involved for specific numbers of coals for each size oven (like the '3-up, 3-down' method) and the VERY involved charts and hard to remember methods of specific numbers of coals for each oven-heat for each size oven. I posted about this method back in reply #7 in case anyone wants a more complete tutorial on the method and it's origins and brilliant authors. If you are an aspiring Dutch oven cook, I suggest that you copy it and keep it in your 'safe deposit box' or have it tattooed on your left forearm in case the link disappears in the future like so many of them seem to do! Thanks Wolfy for the graphic. 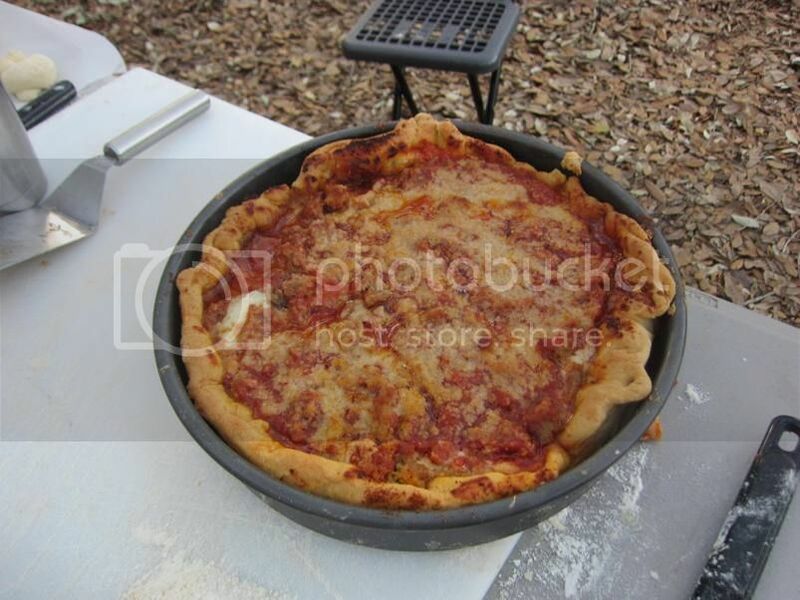 I'll be using this method this weekend for a Chicago Deep Dish Pizza that I normally cook at home in a 450 Degree oven. I'll use the 2 1/2 rings on the top in a 12" DO to get the desired temp working. I'm sure it will work fine. I've used this method before, and it has NEVER FAILED. Be sure to take a picture or two of the results, Greg......I'm sure everyone would like to see just how well this method works, too. I recall seeing photos of a batch of cinnamon rolls that you baked at one of the past Krac encampments......th ey we're absolutely PERFECTOMUNDO! Wolfy, below is the Deep Dish Pizza I made in a D.O. this past weekend. I used one ring on the bottom and 2 1/2 rings on the top to obtain a high heat in the 450 degree range. No problem with the oven temp, that worked out great, but my internal oven arrangement was flawed. As the first time ever cooking a Deep Dish Pizza in a D.O., I thought I'd raise my 10" deep dish pan off the bottom of the oven with a trivet to help circulate the heat around the pizza pan. During the baking process, the top was getting done, but the bottom was not getting the crispness I was looking for. I ended up removing the top coals, and adding a fresh hot ring around the bottom perimeter for the last 10 minutes or so, and that got me the crispy bottom I was looking for and the pizza turned out great. Next time, no trivet and just trust the coals on the bottom to do their job, just like when baking bread or biscuits. I'll confirm that pizza was great, I sure ate my share and then some. Thanks Greg for all the wonderful baking you did for use this weekend. Yep. We sure do enjoy Greg experimenting on us. That pizza looks terrific, Greg! The 'ring method' really does make for evenly done baked goods....the proof is in the pudding, as they say, by the perfectly finished pizza you show in that picture! The problem of a less-than-crispy bottom crust usually occurred when I baked a pizza in a pizza pan instead of directly on the bottom of the oven. Problem there is, I don't like to do that for a couple of reasons. Number 1....I don't like cutting pieces of pizza right in the oven....it's not only hard on knives & a nicely seasoned oven bottom, but awkward to serve, too. Number 2.....I like having the oven vacant for the next pizza in line to be baked. HINT: Use a little hook made from a piece of coat hanger wire to hook the edge of the pan so you can get hold of it with a gloved hand to remove from the D.O. 12" pizzas are usually what I bake, but pizza pans designed for 12" pizzas won't fit in a 12" Dutch oven, however most all 12" pizza pans WILL fit perfectly in a standard 14" Lodge. The biggest problem with using pizza pans in the D.O. is exactly what you ran into......it takes longer to brown & crisp up the bottoms. The top looks perfect, but the bottom, while 'done,' is not as perfect looking as the top. There are a couple of ways to remedy that situation. As you noted, the bottom ring of coals burns down considerably from the 10 minute pre-heat period to the end of the cooking period. You can get by with that if the pizza is baked directly on the oven floor, but not in a pizza pan....even if it rests directly on the bottom of the oven with no trivet in place. As the coals diminish to about half size, I just push a few more in under the edge to keep the spacing down to zero and the heat from dropping under the oven. The mostly-spent old briquettes are mostly ash, anyway. Another thing we've done (which works, but is not as handy) is to pre-bake the crust for about 5 minutes on the pile of coals that we will eventually arrange into the bottom and top rings. That gives us a much hotter oven-bottom to start with and it gives the bottom of the crust a head start before the toppings are added. After the prepared pizza sauce & toppings are added, the normal rings are arranged, the oven's bottom-heat settles down and baking can be resumed for a normal baking time. I think it's more of a pain in the wahzoo to screw around doing it that way, though. Pushing a few newly-lit coals under the outside edge halfway through the baking period works just as well and is, by FAR, the easiest way to go. You really have NOTHING to complain about, my friend......your baked goods look outstanding! It took me a loooong time to get stuff coming out of my ovens that looked like that. I hope you can gather a couple more pictures of your biscuits and cinnamon rolls from your camp this last weekend and add them to this thread. It would demonstrate just how well the 'ring method' works for those of us that use it! Greg is an outstanding baker no doubt. I got a few extra biscuits to take home to Kelly and a cinnamon roll. She loves those homemade rolls. I have some ideas for this summer's C.I. cooking. I might need to pick up another 8. Here's another site that has a few decent looking/sounding recipes in it. If nothing else, the pictures will have you drooling.